Since the publication of his book Radical Enlightenment: Philosophy and the Making of Modernity, 1650-1750 (Oxford University Press, 2001), Jonathan Israel is contributing to a new writing of the modern era, placing the "Spinozism" in the center of the juice. Senior researcher at the Institute of Advanced Studies (Princeton, USA), he travels the world defending the relevance of Spinoza’s philosophy to think on the concept of democracy. His new book, The Expanding Blaze: How the American Revolution Ignited the World, 1775-1848 (2017), defines a new stage in his work. 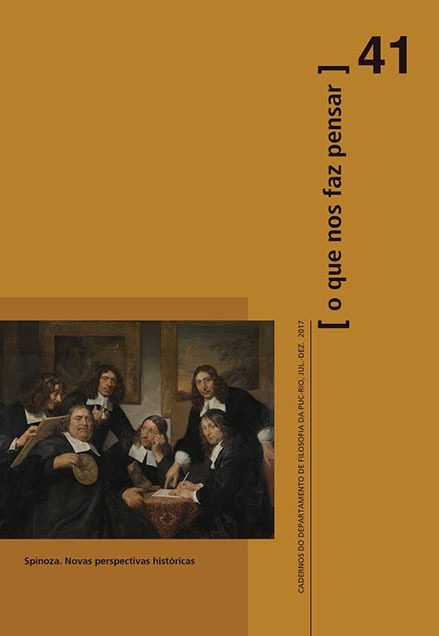 Desde a publicação do seu livro Radical Enlightenment: Philosophy and the Making of Modernity, 1650–1750 (Oxford University Press, 2001), Jonathan Israel está contribuindo a uma nova escrita da época moderna, colocando o “spinozismo” no centro do jugo. Senior researcher no Institute of Advanced Studies (Princeton, USA), ele viaja o mundo defendendo a relevância da filosofia de Spinoza para pensar o conceito de democracia. Seu novo livro, The Expanding Blaze: How the American Revolution Ignited the World, 1775-1848 (2017), marca uma nova etapa no trabalho dele. ROVERE, Maxime. Spinozism, or how to raise higher political consciousness - Entrevista com Jonathan Israel. O que nos faz pensar, [S.l. ], v. 26, n. 41, feb. 2018. ISSN 0104-6675. Disponível em: <http://oquenosfazpensar.fil.puc-rio.br/index.php/oqnfp/article/view/581>. Acesso em: 21 apr. 2019.